New Sea Angler - New Sea Angler comes home with Salmon limits with the largest at 37 lbs. New Sea Angler comes home with Salmon limits with the largest at 37 lbs. Rick Powers called in with this report for the New Sea Angler out of Bodega Bay Sportfishing. "35 Anglers caught full limits of Salmon, that's 70 Salmon to 37 lbs. We also caught full limits of Rockfish, that's 370 Rockfish along with 6 Lingcod to 9 lbs. "We fished for the Salmon off Bodega Head, trolling. It was a wide open bite, big fish, probably a solid 14 to 15 lb. average with fish into the 30's. We fished for the Rockfish off of Ft. Ross. 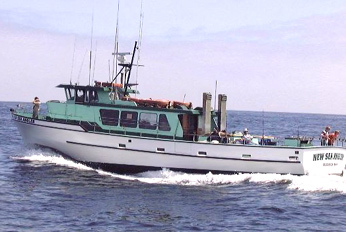 "Fishing remains excellent if you are interested in our Salmon/Rockcod/Lingcod combo trips. We have plenty of room thru next week. For more information or to make a reservation call 707-875-3495."